Start by styling hair in its natural form. Before drying your hair, you might want to use some products depending on the type of hair you have. If you have curly hair, use the Momo anti frizz serum to add some shine and minimize frizz. For straight fine hair, use Davines defining spray to give hair some texture. 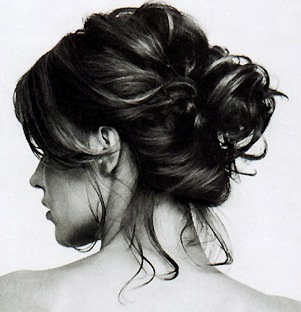 To dry hair, flip hair over into a loose bun, hold the bun with your hand then blowdry all around the head till dry. Let go of the bun and this will give you a tossled, beach wave look. Part hair in the middle, then start grabbing one side of hair with your fingers softly towards the mid back of your head. Secure with bobby pins. Do the same on the other side. Make sure to let any short pieces in the front and side to fall naturally around your face frame. For the remaining of the hair in the back, twist it into a loose bun then secure with a bobby pin. Finish the style off by using the Davines Defining glam power spray. Remember, two or three sprays should be enough. Now your ready to strut the streets, the park or at the beach!